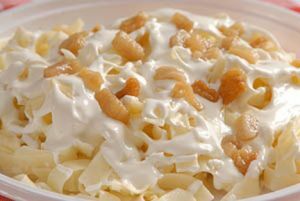 Túrós Csusza | Noodles with Cottage Cheese is a Hungarian food recipe with bacon. Cook noodles according to directions on package. When done, drain in a colander. In a large saucepan, fry bacon until nearly crisp. Drain on paper towel, and save bacon fat. When bacon is cool enough to handle, break into small pieces. Add noodles to bacon fat. Stir well and cover. In a medium saucepan, heat cottage cheese and sour cream over medium heat, stirring constantly, until hot. Add half of cottage cheese mixture to noodles and stir well. Place on a warm serving dish, cover with remaining cottage cheese mixture, and garnish with fried bacon pieces.